(Tetum) “Taste tests are important because farmers like to plant, eat and sell crops that taste good and have a high production,” said Felisberto Amaral Soares, a MAF-SoL Researcher. He was speaking at a two-day taste test event held at Betano Research Station last week to compare eight varieties of sweet potato and winged bean. A farmer from Betano tastes Hohrae 3 at the taste test event at Betano Research Station. 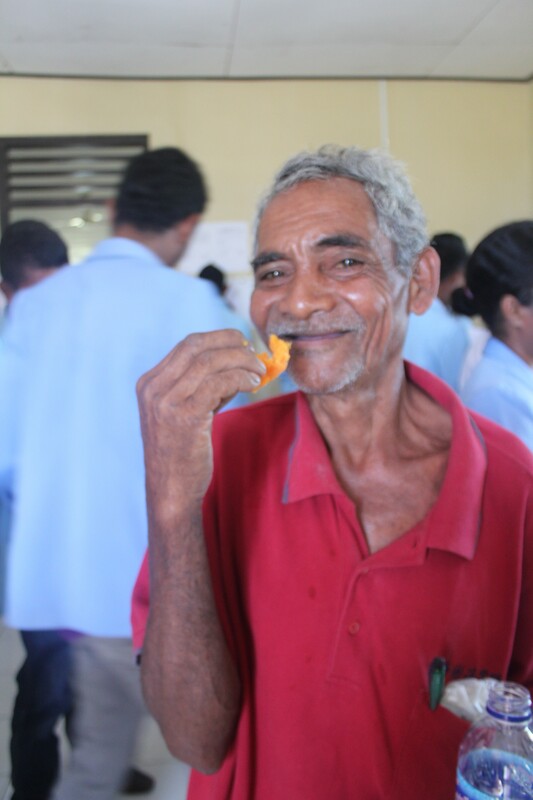 Farmers from around the Betano research station, internship students from the University of Timor-Leste and MAF-SoL staff participated in the taste tests. For sweet potato, results showed that people liked the flavour of Hohrae 1 and Local Mutin the most, followed by the CIP 71 and CIP 77 varieties. According to Felisberto, during the eight years of MAF-SoL research on sweet potato, the released varieties (Hohrae 1, 2 and 3) have shown a consistently high yield. For this year’s harvest season, Hohrae 1 produced 13.93 tons perhectare at Betano Research Station. For the winged bean taste test, the local wing bean from Lospalos was chosen as the tastiest followed by winged bean varieties from Papua New Guinea and Thailand. This is the first time a winged bean taste test has been held at Betano and follows the first-ever SoL winged bean taste test in Loes in September 2013. Local winged beans from Lospalos. “After Betano, we will be planting winged bean in Baucau and Aileu district to see how it adapts to different elevations, climates and conditions. “Winged bean is nutritious for farmers, and it also improves soil fertility, suppresses weeds, and increases the nitrogen level in the soil,” he said. Hear Regina's story: After changing the variety of rice the group grows to the Ministry of Agriculture's improved rice variety, Nakroma, Regina and her members have seen improvements in yields, resulting in higher profits. Download via Vimeo.